Bowl developed specifically for the Microwave. Anti skid base helps children to feed themselves. Lid closes tightly and keeps the food fresh & protected from contamination. This bowl will come with fork and spoon. 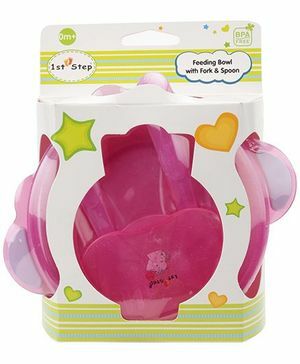 Great product to make up some nice and creative eateries for kids or a party. Good for making ice, jelly, home made chocolate too. Light weight, food grade silicon based. Easy to remove the ice/jelly. The product is average..once you open the lid from packet it becomes tougher to fit in again..It says airtight lid but lid not properly fits in..Also the spoon and fork cover is loose..spoon and fork comes out from its cover again and again..
Upper lock for spoon n fork not working properly it is very loose .